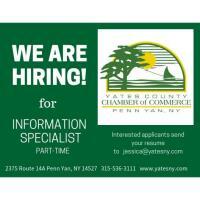 The Yates County Chamber of Commerce is hiring a Part-Time Information Specialist. Duties and responsibilities include providing administrative support to ensure efficient operation of the office. Supports all team members through a variety of tasks related to organization and communication. Is responsible for providing excellent customer service to visitors. Ability to effectively communicate via phone and email ensuring that all duties are completed accurately and delivered with high quality and in a timely manner. Please contact Jessica Bacher at 315-536-3111 or jessica@yatesny.com.